On Wednesday, the Dallas City Council approved the selection of AECOM, an international, Fortune 500 consulting firm, to help develop a climate and environmental plan for Dallas and the surrounding community. Rita Beving speaking at Dallas City Council meeting that launches Dallas’s efforts to mitigate climate change. AECOM has given assistance in climate and sustainability planning to other cities including Mexico City and Los Angeles. The vote marks the beginning of the climate planning process for Dallas to reduce its carbon footprint. The planning process offers many different avenues to reduce greenhouse gas emissions, including electrifying transportation, investing in green energy, retiring fossil fuel generation, securing commitments from industrial emitters and promoting energy efficiency. The planning process will immediately commence in the upcoming weeks with an eye on a final plan to be reviewed in the spring of 2020. It will involve a public process with stakeholders from business, industry, academia, the environment and the community. Along with the selection of the consulting entity that will help develop the climate plan, the City of Dallas passed a multi-faceted resolution directing the City Manager to take the necessary actions to join the network of C40 cities. The C40 is an association of the world’s largest cities committed to addressing climate change, connecting 96 of the world’s greatest cities to take climate action. 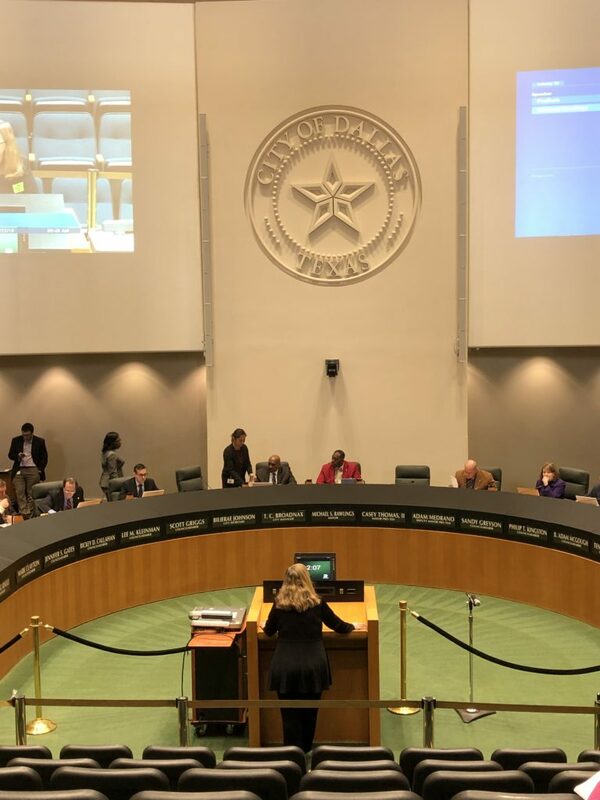 Additionally, the resolution also directed Dallas to support federal action on climate, supporting a proposal by Citizens Climate Lobby for congressional approval of a national carbon fee and dividend. The carbon fee and dividend concept is part of the bipartisan Energy Innovation and Carbon Dividend Act introduced in Congress in 2018. The act provides for a national, revenue-neutral carbon fee-and-dividend system (CF&D) which would place a predictable, steadily rising price on carbon, with all fees collected minus administrative costs returned to households as a monthly energy dividend. Dallas took the necessary steps this past Wednesday to chart a course toward rapid and decisive action at both a federal and local level to combat climate change. And I applaud their broad and aggressive action. It is time that other cities in the DFW area also take the challenge to step up for their citizens and the region by pursuing their own climate plans and other initiatives to help clean the air and cool the planet.